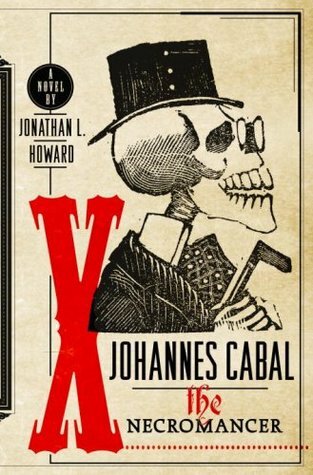 For me, Johannes Cabal the Necromancer started to drag near the ending. By that time, the clever turns of phrase and the odd situations had begun to lose their shine. The first time Johannes went to hell, I was amused by the idea of the gate being guarded by the overly bureaucratic Arthur Trubshaw, whose job it is to make the deceased fill out copious forms before entry. Arthur, we are told, lived a life of "licentious proceduralism". By the time we meet Arthur for a second time however, I was pretty much done with the joke. Johannes Cabal the Necromancer included ableism as part of its humour. Sure, the idea of a man who kills people because he is socially invisible did make me laugh however it was coupled with the equation of mass murder and mental illness. Yes, these murders were absurd and often times fun but there was no need to juxtapose mental illness and violence. The few female characters who appeared were trope laden. We had the teacher who was desperate to be young and pretty. A victim of domestic abuse who saw her abuser as a wonderful strong moral man. An overwhelmed single mother who was tricked into killing her child. A succubus like creature and finally a young innocent blonde woman whose attractiveness caught Johannes's attention. Each every single one of these characters is a trope and none of them played a large role in the story. Johannes Cabal the Necromancer isn't an inclusive book whatsoever. The only reference to heterosexuality was made between the Cabal brothers in reference to Horst's belief that Johannes's resistance to allowing him to feed from him had to do with a fear of homoeroticism. There were absolutely no people of colour. I am truly conflicted by this story. I am glad that it didn't have a pat ending, leaving so much more of the story to be told. Johannes himself was a truly a fascinating character whom I couldn't fully root for, nor could I wish his demise given that his adversary was Satan himself. I cannot even say confidently that I liked this book, even though there were times when it's quirky nature had me giggling. Johannes Cabal the Necromancer should have been right up my alley and yet, something was a little off about it. I guess that the best thing that I can say about this book is that mileage will vary.